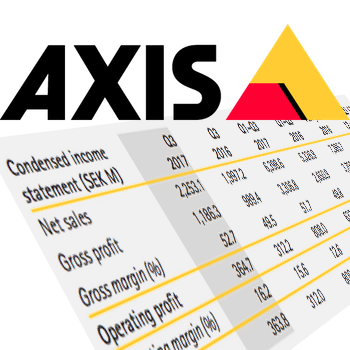 Axis reported strong Q2 2018 financial results and, for the first time in many years, Axis grew faster than Hikvision. However, the company's strong growth has not come without problems as Axis faces a product shortage for the second year in a row. **** ******** ****** ** **** ********* ******* ***, *** *** first **** ** **** *****, **** **** ****** **** *********. *******, *** *******'* ****** ****** *** *** **** ******* ******** as**** ***** * ******* *********** *** ****** **** ** * ***. **** **** **% ** ** ****, ** ***** ******** *****, year **** ****. ********, ***** ******* ********* **** **. *% ** 55% *** *** ******* ****** **** *. *% ** **.*%. *** **** ** **** ********* ******. **** *** ******* **** **** *,*** *********, ** **** ~*,*** 3 ***** ***, **** ********** **** ****** ******** *********** ********** ****** ** **** *** ********* ** *** **** *** years. *** ******** ***** **** ******* ****** **** **% ***** **** was * ****** **%. **** *** *** **** ***** *** **** ***** ******* ******** has ******** ***** ******* ******. *** ****** *** ** **** felt ** ** ****, ** **** ** **** *** ******* reports ****** (*. *., **** ****). ***** ****** ******** ** * ****** ***** *** ******** ** 55.0 ******* (**. *) ****** *** *******, ***** *** ** ********* by, ***** ***** ******, * ********* ******* *** *** ******** currency *******. *** *****, **** ***** ******* **** **** ** *** **% range, **** **% ***** *************** ****. ************* ***** ******* (**** strong ******* ******) ** ********* * ******** **** ** ** shows * ******* *** ******* * ******* ** *** ****** relative ** *** **** ** **********. *******, *** **** ***** ******* *** **** **** * ****** opportunity ** ***** ****** *** **** ******* ******* *** ****** share. *******,*********'* ******** ***** ******* ********* *** **** **** ******, ******** **** ****** **% ** 43.9%. ********, *********'* ******* ** ****** *********** ** ~**%, ***** than **** ******. **** ** * ******** ** *** **** *** *****, ***** Hikvision's ********* ******** ******** *** ***** ********** ** ******** ********* had ********* ************* ********** ****. ** *** ***** ****, **** *** ********* ***** *******, ********* to ****** ******* ** *** ******** ***, ** ***** ******* market, **** ******* **** *** *** ***. ****** * **** ***** * *** ** ***** ************* *** crumbling, **** ** * ****** **** **** ***** ***** ****** out ***** **** *** *** **** ****** ** ***** - a ***** **** *** *** ******** ** * *****. * ***** ***** *** ***** ************* ****** **** **** *** were ************ ********* ********* ********* **** ** *** *** ******: some ********** **** ********* **** *****, ***** *******, *** ******** manufacturers *** **** ******** ************, ****** *** ****** ** *** same **** ****. ***** **** * ****** **** ** **** issue ***** ** ******* ** *** ********* *******.